Acute pain and soreness is inevitable. Everyone has it at one time or another. Whether from playing too much volleyball at the picnic or going for that extra mile on your Saturday run, its going to happen. Just a quick twist of an ankle, or overuse of a muscle, or tendon and there it is. Any activity that causes trauma to a body part causes pain and triggers an inflammatory response (our body’s natural healing mechanism). 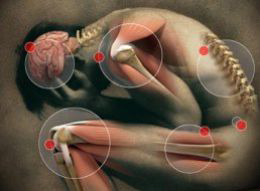 The amount of trauma determines the amount of inflammation and usually the amount of pain. While pain from a soft tissue injury, or inflammation are not the only types of pain, how well you deal with acute inflammation, will play a large roll in how fast you recover from the pain. Ice early on to the site of pain helps with circulation and inhibits the pain. Limit icing to 10 minutes at a time to prevent skin burn. Elevation of the body part above your heart will help with circulation and dissipate inflammation. Massage: mobilizing the soft tissue in the area inhibits pain, stimulates circulation, and helps with healing. Light exercise: Using the involved muscles for light activity helps improve circulation, decreases inflammation, and promotes tissue healing. The activity should be with light resistance and completely pain free to be effective. Other mechanisms that we use in our physical therapy clinic to reduce pain and inflammation include electrical stimulation, compression, dosed therapeutic exercise, and manual therapy with joint and soft tissue mobilization. As always for the fastest recovery possible, a professional evaluation from a MD, physical therapist, or athletic trainer is advisable. These individuals are trained to provide you with appropriate advise for handling an acute injury. If you would like more information on how to manage pain and inflammation, please contact our office, or respond through the comments section. For more tips like these just follow Baudry Therapy Center on Twitter, or like Baudry Therapy on Facebook.